Published on June 22, 2017 in England, General T&T and International. Closed Tags: British Parliament, Stephen Kangal. HM The Queen relinquished the pomp, colour and pageantry that is symbolic and synonymous with the ceremonial State opening of the Palace of Westminster after the June 8 elections. 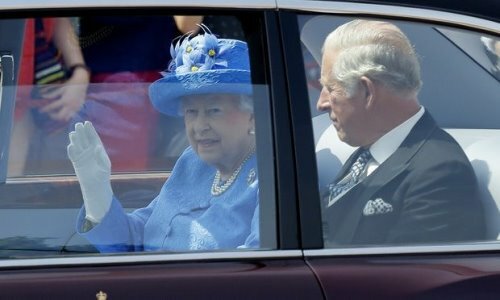 Her Majesty assumed an unusual, low-keyed civilian profile dressed in an EU-blue day outfit to send a further message of the sombre mood into which the UK has descended after four terrorist attacks and the Grenfell disaster that killed 79 people so far. Not since 1976 has the Queen gotten rid of the accustomed royal adornments of the colourful guard of honour of the Household Cavalry and nostalgic horse drawn carriage on her route to Westminster using today a Royal Bentley. 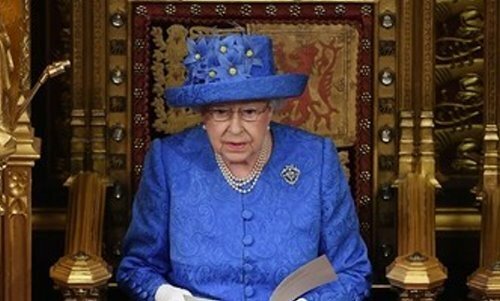 But she also did not wear the Imperial Crown, the flowing robes and other royal regalia while delivering the Queen’s Speech setting out the legislative agenda of her uninspiring minority Conservative Government. The state of the tenuous, embattled, disappointing and lame duck Administration of Theresa May shorn of her majority as well as of her authority and in danger of going under any time soon did not inspire Her Majesty since she may have to do it again very soon. The Queen’s Speech was more notable for what it concealed between the lines than what it revealed audibly. The Government proposes to pass 27 Bills on a variety of subjects having dropped many of the controversial Tory manifesto pledges which the Government relying on all-party consensual support could not pilot easily through Parliament. Westminster as opposed to the Cabinet now represents the locus of across the aisle authority and real power to which the Theresa May government will be beholden to survive the slings and arrows of an outrageous election gone sour and a deeply divided but unforgiving country. Plans to scrap free school meals, ration winter fuel payments for pensioners, repeal the Fixed-term Parliaments Act, and introduce what became widely known as the “dementia tax” for funding social care have been swept away by the election result. The proposed visit of US President Donald Trump is on hold but the King and Queen of Spain will be making an official visit during the parliamentary session. The gyrations of the Brexit negotiations that started in Brussels on Monday 19 Jun dominated the statement. The political, social and economic history of Britain will be bifurcated between before and after Brexit. Brexit will pervade the next two years of British politics with its wild vicissitudes. The Government will introduce 9 Bills on Brexit dealing with trade, immigration, customs, control of access to British fishing grounds, farming and agriculture and the repeal of the EU Laws and their incorporation into the Great Repeal Bill that will eliminate the European Communities Act 1972. ‘…A bill will be introduced to repeal the European Communities Act and provide certainty for individuals and businesses. This will be complemented by legislation to ensure that the United Kingdom makes a success of Brexit, establishing new national policies on immigration, international sanctions, nuclear safeguards, agriculture, and fisheries. The issue of tackling extremism in all its manifestations was addressed in the Speech with the establishment of a Commission on Tackling Extremism. The Queen says the government will bring in measures to cut energy bills. But, interestingly, the government is not promising a bill on this, or even a draft bill. It has been reported that Philip Hammond, the chancellor, wants May to ditch this plan, and all that is being promised is a green paper on the subject (not even a white paper, a more definitive consultation document) and the government is saying it might help people on poor-value tariffs by getting the regulator to act instead of by legislation. The plan for a price cap may will be ditched. MPs will be asked to support the speech in a vote next week – and opposition parties are likely to table a series of amendments.